"If Tim Hetherington (who, at 40, had only just begun his career as a feature-length filmmaker after years spent working as a photojournalist in West Africa) could be said to have a directorial style, it lay in this sense of rawness and disorientation. He sought to document the experience of war and political unrest from the point of view of an individual, a vulnerable body struggling to make sense of chaos and violence—which makes the news of his death, that ultimate vulnerability, all the more sickeningly sad..."
"Hetherington's highly subjective, almost poetic vision of the events he spent his life documenting is on plain view in his remarkable 2010 short film Diary. Diary isn't, by any meaningful definition of the term, a documentary. 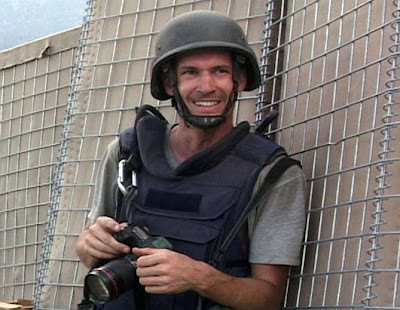 It's an impressionistic 20-minute collage of images and sounds, a sketchbook of Hetherington's memories from a decade of war reporting..."
"Diary doesn't feel accomplished or even quite finished, which is part of what's so gripping about it. This is clearly the work of someone trying to figure out what he wants to do as he's doing it..."
"His short films' distinctly nonjournalistic concern with perspective and voice—with interpretation—indicates that Hetherington was exploring new ways to look at and think about the large-scale human suffering that had long been his subject matter as a journalist. That he didn't live long enough to make more movies is just one of the many reasons to mourn him."